Over the last year or so, I have become increasingly interested in taking on longer, more challenging runs. After reading the book “Born to Run” by Christoper McDougall, I was fascinated by the world of the elite ultrarunners – they are a very quirky and adventurous bunch who find ways to push their bodies to physical extremes. As I was learning more about ultramarathon racing, I stumbled across the podcast entitled “Running Stupid”. This podcast, published every few weeks by a 40-something, self proclaimed “back of the pack” (that’s the nice way of saying “slow”), overweight, but joyously funny ultrarunner named “Coach Ken” regularly describes the challenges, successes and failures of an average Joe runner, and provides a window on the world of the more elite runners from his perspective. In short, reading this book, and listening to these podcasts had me hooked – I had to try an ultramarathon. There was a problem with this dream, this check box on my bucket list – running long races requires a LOT of training. My life is pretty busy, and I knew from past experiences that my body almost always breaks down if I attempted to train for long or ultralong events. Over the last year, however, I discovered that I could do, and enjoy regular road marathons with far less training than is usually prescribed, as long as I got in one very long run (at least two hours) every week, and as a result was successful in completing and actually enjoying two marathons in the last year. Could this same regimen work for an ultramarathon? Could I finish? Could I feel good enough that I actually enjoy the race? Ultramarathons typically range from 50 km road races (about 31 miles) to 100 miles on road or trails, or even more. I knew I had better look for one on the short side, for obvious reasons. A few months ago, I noticed an announcement for the “Moosalamoo Ultra” a 36-mile race to be held on the trail network of the Moosalamoo region on August 18. This seemed like a great one to try – readers of this blog will know that I am quite familiar with the trails here, and it had the added convenience of being close to home. In fact, looking at the race course, I had previously run almost all of the trails on the course at some point or another, and I described the course as “four or five great runs – all in one day!” The race was being organized by John Izzo, a Salisbury resident and avid local runner, with the Blueberry Hill Inn as its base of operations and start/finish area. So, I lined up at 8 am on Saturday with about 100 other runners, about half of whom were doing the still very challenging 14 mile version of the race. Usually, in this blog, I go into a fair amount of detail on the route, but this particularly elaborate course pretty much defies a detailed description. I am going to include a Google Earth projection as I usually do, and also make a link to the course map. John clearly put a lot of thought into mapping out a great piece of running which covered pretty much every corner of the Moosalamoo region, with some very challenging climbs (the first loop up and over Mt Moosalamoo), an out and back section in the first half of the race, so that runners could have a feel for where they stood in the pack, some very muddy sections (yes, there is plenty of mud out there, even in this dry summer), and some particularly drop dead gorgeous sections of trail (the Chandler Ridge/Leicester Hollow loop comes to mind). The course was also well supported with volunteers, many of whom were John’s family, at aid stations throughout the course. A 20-ounce water bottle that fit a waist belt. Hydration, of course, is the single most important concern in a long, midsummer race. With aid stations typically 3-5 miles apart, I usually tried to make sure that my water bottle was empty as I entered an aid station. The one time I neglected my hydration, I paid dearly for it – the terrain between the aid station at mile 21 (on the Goshen Ripton Road) and mile 25 (Silver Lake), was almost entirely easy downhill, so I neglected to drink enough. 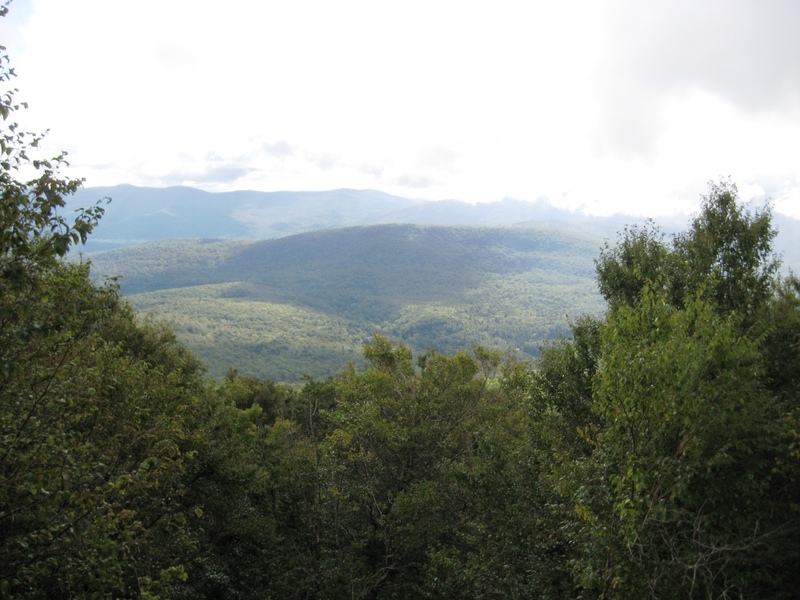 When I hit the next aid station, I topped off my water bottle without any extra drinking, and as a result ran out of water on the next segment – the arduous 5 miles on the Chandler Ridge. I got rather severely dehydrated there, even feeling for a short while like I was not entirely in control of myself, so I took it slow, and took a much longer than usual break at the next aid station where I made rehydration a top priority. Also, the two women (one of whom I found out later was John the organizer’s wife) had actually hiked in a mile carrying all the food that morning, so they deserved to have someone stop and chat for a while! Food – In almost all long workouts and races, I depend on the nasty, slimy, but wonderously rejuvenating little packets of Gu as my main source of sustenance. I always ingest one packet after every hour of running, so I went through 9 Gu packets over the duration of the race. Yup, I WAS out there a very long time – you do the math! I am no longer feeling the love for the “Espresso Love” flavor! 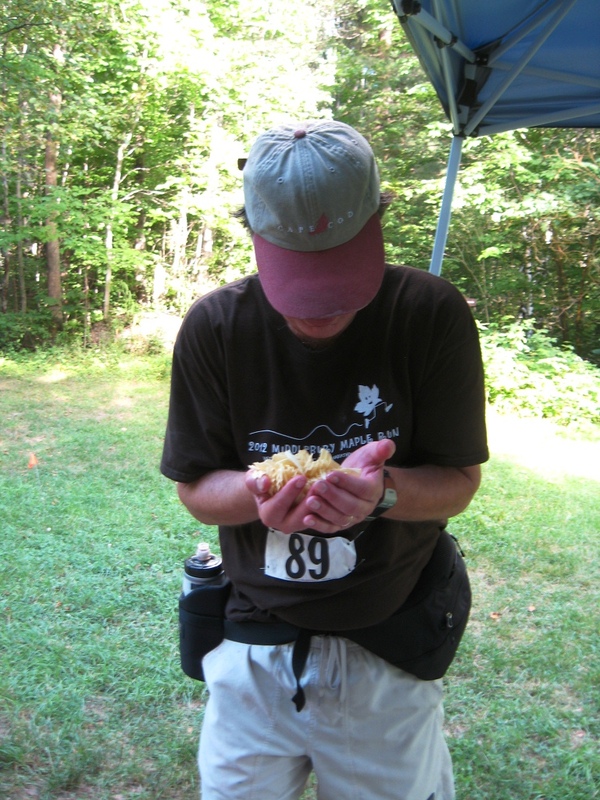 The aid stations were supplied with lots of other calorie rich treats as well, and I found myself drawn to foods which otherwise would have made a typical 10 year old boy happy at lunchtime – PB+J sandwiches and potato chips. I always eat PB+J when I go on day hikes, but had no idea potato chips would taste so good in the middle of a very long exhausting day. I must have eaten a few bags worth. In retrospect, it makes sense that a body would crave the chips – they provide a lot of calories (a typical ultrarunner probably goes through 5 or 6 thousand calories), and have a ton of salt to help that replaced through sweating. I had one of the volunteers take the following picture at the last aid station on the shores of Silver Lake at mile 33, as I prepared to inhale a massive fistful of chips to power me to the finish line. I also brought along some granola bars and these did not work very well! While they are appropriately caloric, they are also very dry, so eating them required stopping long enough to catch my breath so I didn’t cough and choke. They were also reduced to crumbs very early in the race making them even harder to eat. Nope – granola bars are off the list! Camera. I am writing a blog, so it made sense to bring it. Music. I frequently run with an iPod, but never listen to it during a race – half the fun of racing is having conversations with people you meet along the way, and wearing an iPod tells other racers and organizers that you don’t want to communicate. That said, given the paucity of runners and length of the course, I knew that there would be long stretches of solo running, perhaps many hours in duration, and musical motivation might keep me going better. So, I put together the “jbr mix” (Jeff B running) and brought it with me. I ended up never listening to the music however – I had pretty steady company for the first two thirds of the race, and by the last third of the race, I was so depleted that I felt like I needed to pay full attention to my feet, my surroundings, and my general well-being in order to finish the race safely. Electrolytes. I always drink Gatorade during long races, and since the organizers were only providing water, I purchased some powdered Gatorade, and filled about a half dozen plastic bags with just enough for the 20 ounces of water in my bottle at refills. I used most of it, although by the end I was really sick of the stuff, and got my electrolytes from the aforementioned chips and from some salt tablets I had brought with me, and popped once in a while. 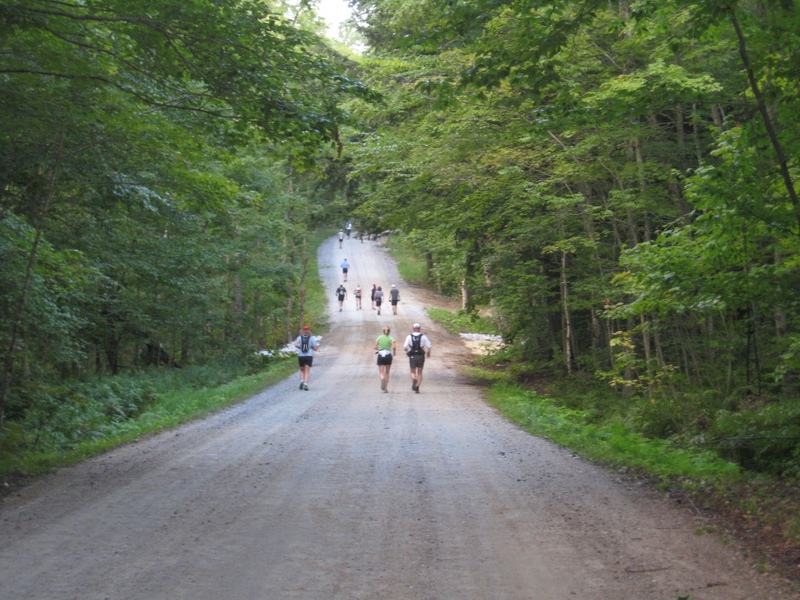 The race itself seemed to have 3 distinct phases – the first third, including the run up and down Moosalamoo had the most challenging terrain, and I had other competitors in sight nearly the whole way, since the short race (14 mile) and long race (36+ mile) runners were all together. This part went by pretty quickly. Curiously, one of the few sections of trail that I had never been on before here was the “dimple” between the two summits of Moosalamoo, and this was the only time I got off course – I probably wasted about a half mile and 5 minutes getting my bearings back there. I also saw two gentlemen hiking carrying what looked to be 100 pound bags of sand without the benefits of a backpack. At first I was mystified, but then I recognized one of the two as someone training for another local ultra-endurance test – the even more masochistic “Death Race”. Although this event had already taken place earlier this summer – perhaps they were training for next year already? The second third had what was probably the gentlest terrain in the race, and it was here that I met and ran with a few far more experienced ultramarathoners who kept me company, and answered my stupid questions. We ran together for a few hours, and they did a very good job of mixing in running and walking so that we could maintain appropriate pacing for finishing. Thanks Josh and Grant from NH! I also knew that in the “long run” I would not be able to keep pace with these two experienced ultrarunners who were 25 years my junior. What did I take from this race? First of all – my modest training regimen is enough for a road marathon, but it really isn’t sufficient for a trail ultra. I did finish, but I need to put more miles into my legs in training to keep a longer race like this fully enjoyable. No surprise there! I would also like to thank John Izzo and his extended family (as well as other volunteers) for the great job they did putting together this new race. I would also like to thank Tony and the crew at Blueberry Hill for use of their facilities as a base of operation and start/ finish line. I think the rest of my blogged runs this summer will be much shorter….. Finally, my GPS measured the course slightly longer than advertised, at 37.5 miles (although about a half mile was spent off course) or about 60 km. I agree with the estimation of about 3000 vertical feet of climbing and descent. 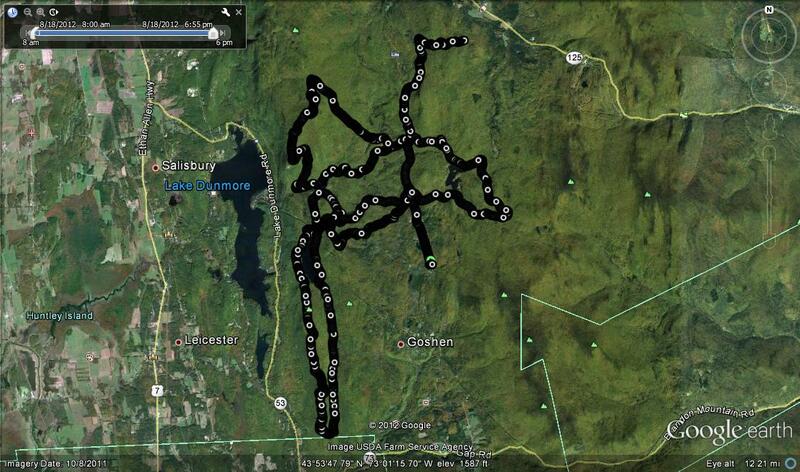 I rode out from BTV on my mixed terrain bike, then up to Silver Lake via 27. I did the Chandler Loop starting at about 4, didn’t see any runners on the trail, but watched a few of them run by as I was setting up camp. I did meet the lovely ladies at the aid station @ Chandler and Minnie Brook who were packing up and let me top off water and snag a Coke and banana. I closed the loop on Leicester Hollow and camped, then did some single track and forest roads back to Lincoln and pave / dirt back to Burlington on Sunday, including the bit around the Sugar Hill Reservoir and Brooks Rd. Chandler Ridge was sort of crazy. I was lugging an odd shaped piece of luggage – kudos to all the runners who took on that trail. I’ve been reading your blog for insight into the terrain down your way. Lots of exploring to do! You must have just missed passing me Mike – although at that point in the day, I was barely recognizable as a trail runner, other than the number on my shirt. And I agree with you that the Chandler Ridge Trail is pretty technical for bikers – it is certainly well beyond my limited biking abilities. I can’t imagine how tough it must have been before they did some trail maintenance with federal money last summer. Glad you are enjoying exploring the trails – the whole chunk of land on that high plateau from Goshen to Jerusalem is full of great mt biking opportunities. Jeff: great recap. Glad it turned out well for you. So, what’s next? VT50?? Jeff. Great Recap. Would love to see you on the trails again soon. Pisgah 50k is a good one that’s just a few weeks away. I’m sure you’ve recovered and that runners amnesia is getting it’s grip. Grant, Loni, Rik, Steve, and I will be there from my team, along with John (RD), Mike and Dave most likely. Thanks Josh! 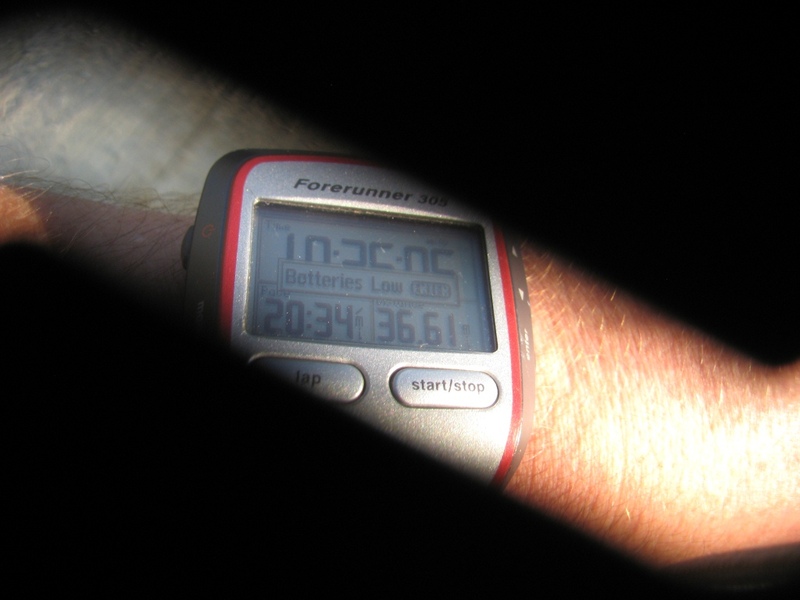 I am afraid the ultra amnesia has not yet sunk in – although a mere 50K would be easy now, right? Love reading your experience. How rocky are the trails on this course? Sorry it took me a while to answer this. Most of the run is on pretty soft terrain, or on forest service dirt roads. There is some slabby running over the top of Moosalamoo early in the race, so you should be careful about slippery rocks, rather than loose rocks. There are also a few rockhopping sections of rather short duration at the lowest elevation sections of the Leicester Hollow trail where it washed out a few years ago. But other than the normal number of “just watch where you put your feet” moments, I would say this is not a particularly rocky run. If you are running it next weekend, good luck! Thanks for the info! I am running it this weekend. I’ve been training in really rocky areas, and not really loving it. But I’m glad its not too bad.